Traditional learning methodologies based on passive transmission of information fail to allow students develop a set of competences that are required in their professional life and in their relation with the surrounding Society. This is particularly relevant in Engineering and Technology-oriented higher education: an engineer is a professional practitioner, concerned with applying scientific knowledge and ingenuity to develop solutions for technical problems. The work of engineers forms the link between scientific discoveries and their subsequent applications to human needs through new technological solutions. The responsibilities of the engineer may include defining problems, conducting and narrowing research, analysing criteria, finding and analysing solutions, and making decisions. Engineers must weigh different design choices on their merits and choose the solution that best matches the requirements. Their crucial and unique task is to identify, understand, and interpret the constraints on a design in order to produce a successful result. 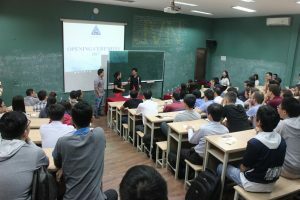 At the same time, engineering and technology-oriented higher education are also finding difficulties in attracting new students. We cannot forget that this generation is the “net-generation” or “digital natives”: they quickly absorb information in shorter chunks, they expect instant responses and feedback and they want to be active in their learning. Therefore, Higher Education Institutions are required to modernize their pedagogical methodologies, moving into active learning processes whereby students engage in activities that promote higher order learning skills like analysis, synthesis, and evaluation. Project and Problem-based learning (PBL) are active and learner-centred methodologies in which students develop their knowledge and competences by following a problem solving process, usually based on real-life situations. The identified benefits for engineering and technology students are considerable improvements in critical, lateral and creative thinking, problem solving strategies, intrinsic motivation, group collaboration, communication skills, entrepreneurship and integration with the society. In a convergent path, games and simulations can be instantiated for learning as they involve mental and physical stimulation and develop practical skills – they force the player to decide, to choose, to define priorities, to solve problems, etc. Games can also be social environments, sometimes involving large distributed communities. They imply self-learning abilities (players are often required to seek out information to master the game itself), allow transfer of learning from other realities and are inherently experiential with the engagement of multiple senses. Therefore, gaming and simulation environments are excellent learning tools, because they can replicate real contexts or even provide training situations that occur in very specific circumstances while retaining the players’ motivation to learn. Supporting active learning through ICT tools (virtual social communities, games and VR/AR simulations) creates a Virtual Learning Environment (VLE) where the new technologically-savvy generation of students feels comfortable and are motivated to be active. These tools, advanced Open Educational Resources, highly interactive and immersive, will be used to scaffold learning for higher education engineering and technology students, promoting the development of staff and students in ICT methodologies.